Monde Condominiums reimagines waterfront living in downtown Toronto. International architecture. Pure design. Versatile space. Intelligent living. Life, inspired by nature, on Toronto's new blue edge.. The development, comprised of a point tower and podium, will achieve a delicate balance between glass and traditional masonry, punctuated with windows and balconies. Its proximity to downtown Toronto and location directly on Lake Ontario will make East Bayfront one of the world’s most significant waterfront communities. 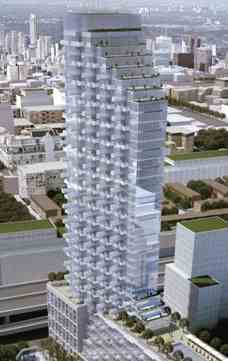 The Design team includes Quadrangle Architects Limited; Janet Rosenberg + Associates and Cecconi Simone Inc. The Parkside development, with its “Gardens in the Sky” design philosophy, will be a landmark for the new waterfront neighbourhood. Developed by Great Gulf and designed by world-renowned architect Moshe Safdie, the 36-storey tower will be located north of Queens Quay, just east of Sherbourne Common. 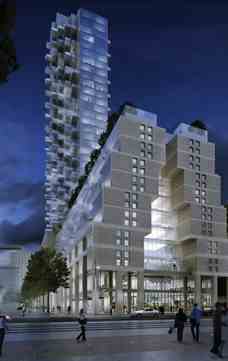 Monde is the first private sector development in East Bayfront bordering Sherbourne Park. This beautiful building will attract residents, businesses and visitors alike. Monde offers stunning views to Lake Ontario and will become a premier residential and commercial complex in the heart of East Bayfront.